A fun slice of Jenga gameplay for your tablet. Your immediate thought upon firing up The Big Big Castle for the first time is likely to be "Oh God no, not another free-to-play tower-builder?" We confess it happened to us, but brush those thoughts aside you cynical and jaded old thing, because in its purest form The Big Big Castle is one gigantic, frantic game of Jenga. 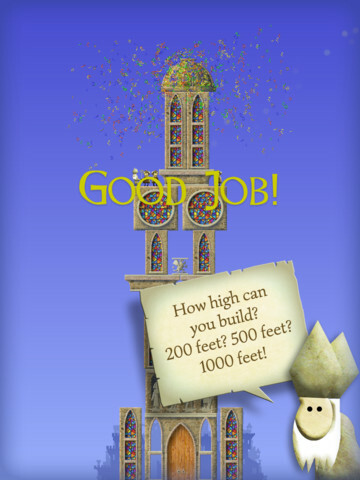 Across all of the game's levels, you're presented with a stream of building pieces: some long, some narrow, some tall and some short, and you need to choose carefully between them before stacking them on top of each other to reach a marker in the sky. This being a physics title, you need to very carefully balance each element if you're to avoid sending the whole thing crashing down to earth. Simple though it is to reach the marker, you also want to be grabbing the coins that are spread throughout the air. They take different cluster formations and you have to build some insanely precarious structures to reach them all and get a juicy high score. Mercifully, and unlike in Jenga, you're allowed to cheat by remanipulating the building, catching falling pieces, and doing whatever's needed to rescue the whole sorry mess. Each new tier of levels throws something new into the mix, so while at first you need to concentrate on just carefully piling on the random assortment of building pieces, later on you'll have to make it sturdy enough to survive cannon fire, save princesses suspended from balloons, or carefully store TNT crates. You can even get stuck into an endless mode once you've exhausted the game's levels. Bored of building towers? The Big Big Castle throws one more clever trick into the mix. All of your creations are stored so that you (and your friends) can compete to destroy those marvellous creations with cannon-balls and lazer-beams from a never-explained roaming UFO. This is a free game, and so you only have a limited number of these weapons at your disposal. If you want to compete long-term with your friends, you're going to need to hit the in-app purchase store to spend your coins, and yes you can buy more with real money if you run out of coins. 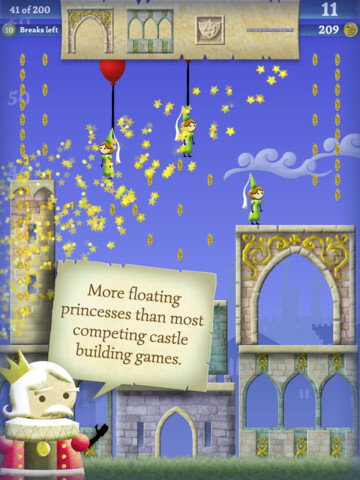 Even if you feel disinclined to part with an eternal stream of money in the multiplayer, the single-player component of The Big Big Castle offers more than enough to justify a download. It's a fresh and enjoyable take on the physical gameplay we've all become familiar with at drunken parties in the past, and you shouldn't let any freemium quibbles put you off at least giving the game your best shot. 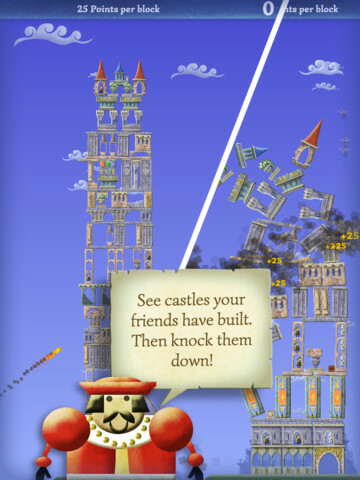 What's Hot: A fantastic Jenga-like for mobiles, with some nice humor and artwork. What's Not: We'd really rather have paid for the game outright, and grabbing pieces is sometimes a bit fiddly.